There’s no shortage of innovation when it comes to the future of multi-touch and touchscreen devices — touch screens allow richer interactions between users and their devices. As touch screen smartphones and tablets are becoming more widely used, consumers are becoming more comfortable with the idea of different types of interactivity than the typical mouse and keyboard. While mobile devices are popular, companies like Microsoft and IBM have developed different types of touchscreen devices. Microsoft Surface is a tabletop multi-touch device that recognizes electronic devices like cameras and credit cards as well as different users’ gestures. Surface was developed with the hospitality and service industries in mind so consumers can access information, pay bills, share photos or order food. Since Surface recognizes several users, it is useful for collaborative work and allows many users to gather around the device to work on a particular electronic project. Companies like AT&T have forged partnerships with Microsoft to develop applications for the Surface. Cynergy Labs, a company specializing in development of Internet applications, created a Star Trek application for Surface display at the Star Trek Exhibition at the Tech Museum in San Jose, California. Flexible touch displays have been developed, though practical applications aren’t yet apparent. Impress, a touchable “screen” made of memory foam and pressure sensors, reacts to a user’s touch and modifies projected images based on the user’s gestures. IBM’s Everywhere Displays Project has been in development since 2003, but has recently been showing up at technology expos. This “touch anywhere” technology uses a projection system to display interactive elements on any surface, creating a bi-directional experience (the user sees the display and the display “sees” and reacts to the user’s gestures). Users can interact with the images as they would reality. Retail stores have used Touch Anywhere technology to guide customers to specific products or to suggest items that the user might be interested in. A wine store in Germany shines a light in front of a particular wine that a user selects on a screen. Interactive touch exhibits have been shown at tech conferences since 2000. Popular displays include Mine Control, Inc.’s balloon, sand and volleyball programs where users can interact with projections of water or butterflies or even play virtual volleyball. Dozens of these exhibits are displayed permanently around the globe, primarily in Children’s Museums and discovery centers aimed at educational fun. 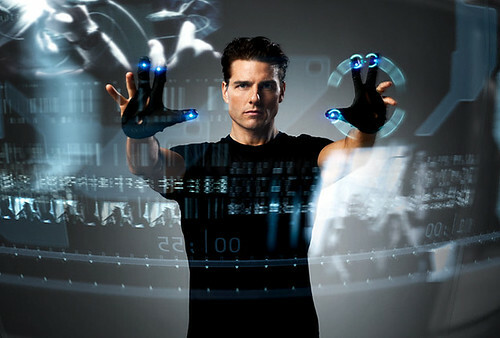 In terms of touch technology replacing the keyboard and mouse configuration, Cynergy Labs have developed and demoed control gloves similar to what Tom Cruise’s character in Minority Report uses to interact with his computer. The gloves utilize Nintendo’s Wii-mote sensors and allow the user to manipulate images and elements on a large computer screen using Windows Vista. Since each device is the best medium for doing certain types of work, the current mouse and keyboard desktop design won’t go away, just become integrated with projector displays, mobile devices, cameras, televisions, etc. Each medium will allow for maximum control and collaboration with all types of multimedia.